In this article we will show you, How to write C Program to Calculate Area Of a Circle with example. 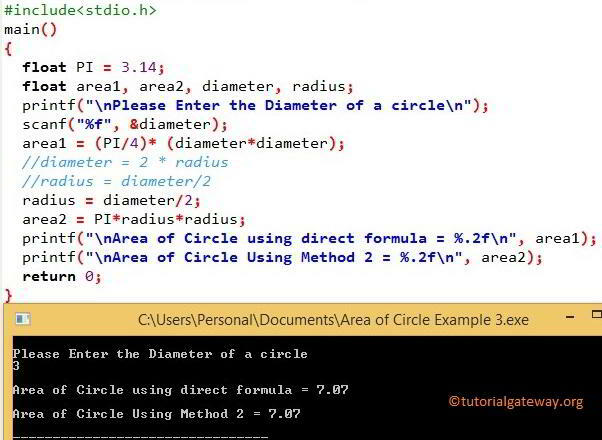 Before we step into the program, Let see the definitions and formulas behind the Area Of a Circle. ANALYSIS: We included one more header file called <math.h>, it will allow to use pi without declaring it. This program allows user to enter the value of a circumference and then it will calculate the area of circle as per the formula. We defined pi as local float variable and assigned value as 3.14. This program allows user to enter the value of a diameter and then it will calculate the area of circle as per the formula we shown above.